The vío ® TMC receiver enables navigation systems with hard-wired external GPS receivers to receive TMC traffic messages and to route drivers automatically around areas of congested traffic. 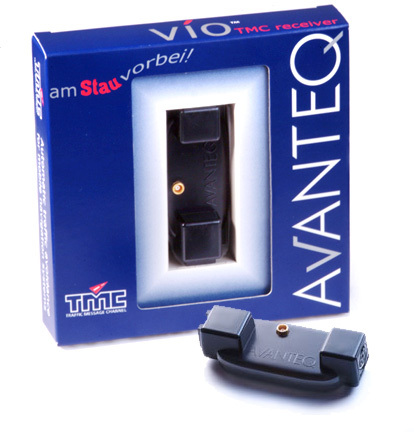 The vío ® TMC receiver can also be used for many navigation devices with internal GPS receiver. 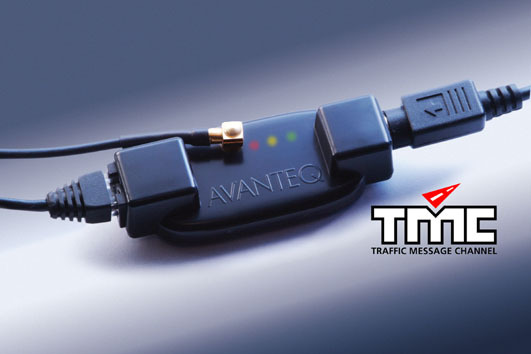 The vío ® TMC receiver is simply plugged between the PDA and the GPS receiver as intermediate connector and the PDA navigation unit can immediately receive all current TMC traffic information and automatically adapt the route to the traffic situation. vío ® automatically detects the connected GPS receiver and its baud rate. vío ® fits most hard-wired GPS receivers, e.g. those from Amaryllo, Evermore, Fortuna, Globalsat, Haicom, Holux, Keomo, Leadtek, Navilock, Polstar, Rikaline, Road Navigation, SysOnChip and XAiOX with RJ11 or PS/2 connector. Thanks to its clever circuit, it works on this simple principle: if the connector fits, it will work. The vío ® TMC receiver is compatible with all TMC capable versions of the navigation programs from Destinator Technologies, iGO, MAP&GUIDE, NAVIGON, and Sygic. ** additional Pay-TMC reception in preparation. *** for PDA; in preparation for Win XP. In case you miss your navigation software in this list we invite you to contact us. Probably we will be able in a short period of time to add it to our compatibility list. Thanks to high-quality components, e.g. gold plated high frequency connectors for the antenna and SUPERTUNE ® technology with elaborate methods for searching broadcasting stations vío ® has best reception. Its unobtrusive antenna can be hidden well in the car interior. You can completely forgo an antenna in the vehicle interior if the TMC signal of the vehicle antenna is utilized. For this purpose the company ge-tectronic, specialized on integration of navigation solutions into vehicles, has developed together with AVANTEQ a suitable TMC-Y-adaptor for vío ®. LEDs show the reception of TMC traffic information. At last, drivers now know when they can rely on TMC reception. For PDAs with an integrated GPS receiver, vío ® can also be used as a TMC receiver provided the PDA has a connection cable to link to one of the above-mentioned GPS receivers. For further details please consider the product's specifications or the FAQ.